Since 1960, one of the most popular annual events in western Pennsylvania has been Light Up Night in Pittsburgh. Held each year on the Friday before Thanksgiving, this is the night where all of the Christmas lights in Pittsburgh are turned on, and it signifies the start of the holiday season. So, if you’re thinking of heading into Pittsburgh for Light Up Night, I’ve put together this guide to cover everything you need to know about this fantastic holiday tradition. 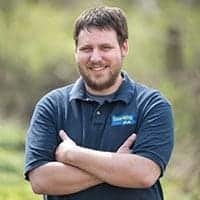 What is there to do during Light Up Night in Pittsburgh? 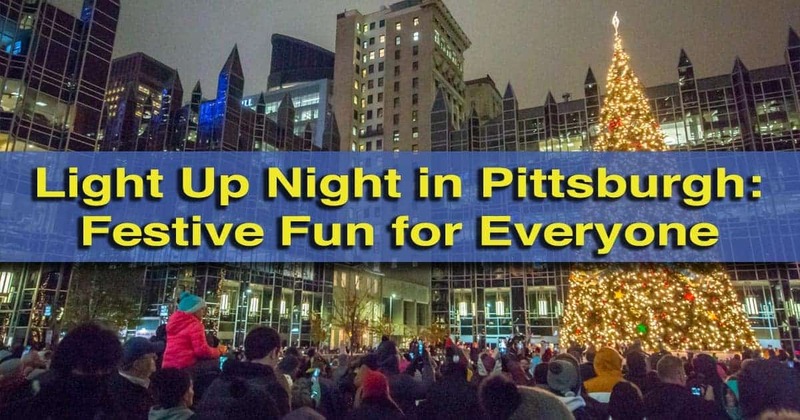 There are many fun things to do during Light Up Night in Pittsburgh. 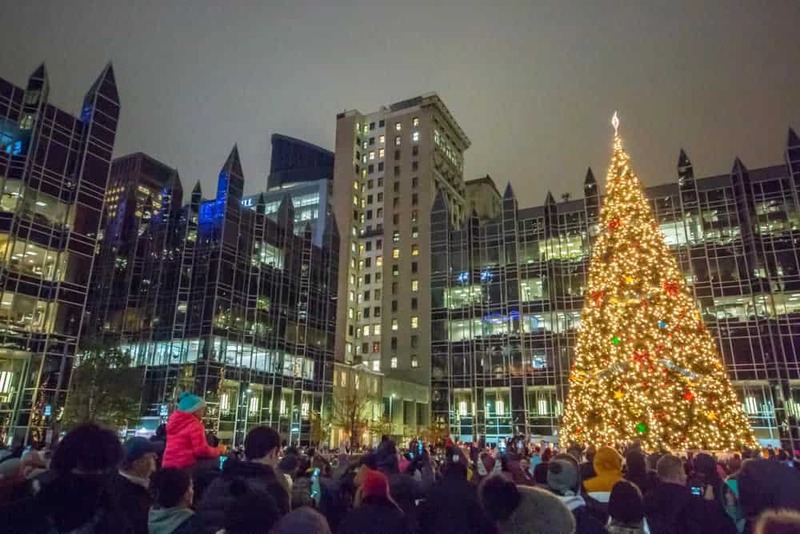 While the most popular events during Light Up Night primarily happen after dark, there are actually things to do in downtown Pittsburgh throughout the entire day. Even better, the majority are completely free. 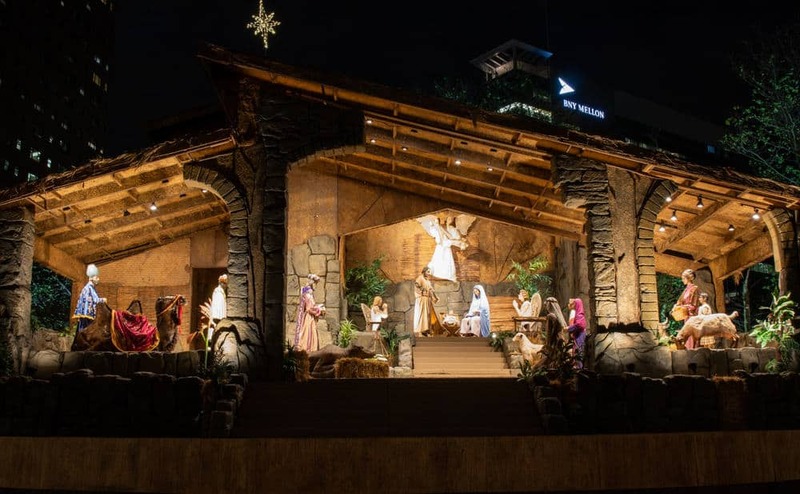 The official events kick off at noon with the dedication of the Pittsburgh Creche, an incredibly large nativity set, in the plaza below the U.S. Steel Building. Throughout the rest of the afternoon, you can stroll through the city, do a little shopping, and just enjoy the beauty of the area. The Pittsburgh Crèche is the only authorized replica of the Vatican’s nativity scene. Between 4:30 and 6pm, there are five different Christmas tree lightings around the downtown area. 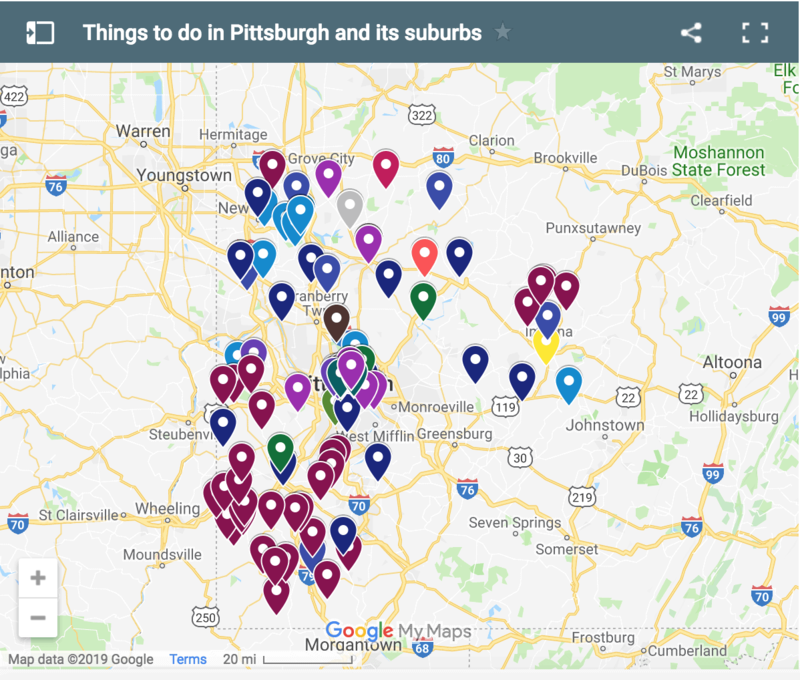 The two most popular are the tree lighting in PPG Place and the lighting in Point State Park (which is actually part of a separate event known as the Santa Spectacular). For the lighting of the tree at PPG Place, there is a bit of show put on before the tree is lit. Even better, the ice skating rink here opens for the season as soon as the tree is turned on around 6pm. The lighting of the tree in PPG Place is one of the most popular activities on Light Up Night. At 7pm, the lighting of the Unity Tree, better known as the Horne’s Christmas Tree, is another highlight of Light Up Night. 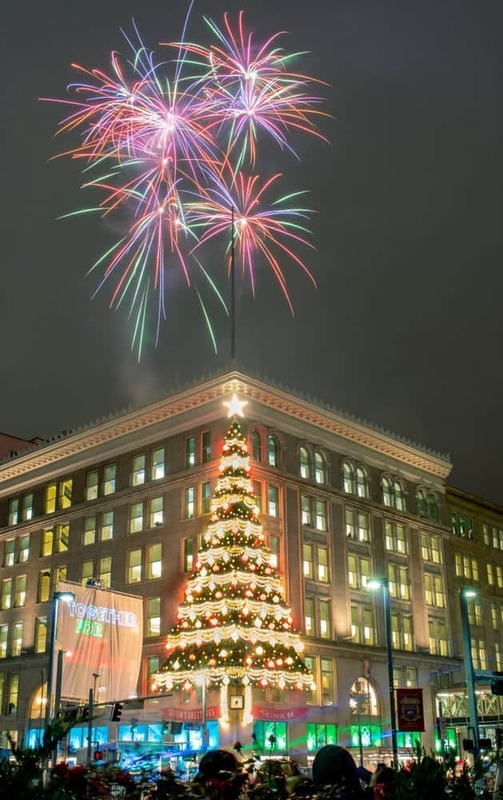 In addition to a short ceremony (which featured Mr. McFeely of Mister Rogers’ Neighborhood in 2018), the lighting of the tree is always accompanied by a very short, but beautiful fireworks show. More on that below. In the downtown area, there are around 10 stages of musical entertainment featuring a variety of genres and even a few national artists. Heinz Hall is also open throughout the evening for free shows by the Pittsburgh Symphony Orchestra. The Unity Tree, also known as the Horne’s Christmas Tree is lit with fireworks. 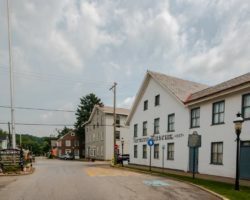 Two of the main stages are typically set up on a closed section of Fort Duquesne Boulevard between the Roberto Clemente Bridge and the Rachel Carson Bridge. Along this roadway, there are also dozens of food vendors if you are looking for something to eat. Light Up Night also marks the opening of the Christmas Market in Market Square. 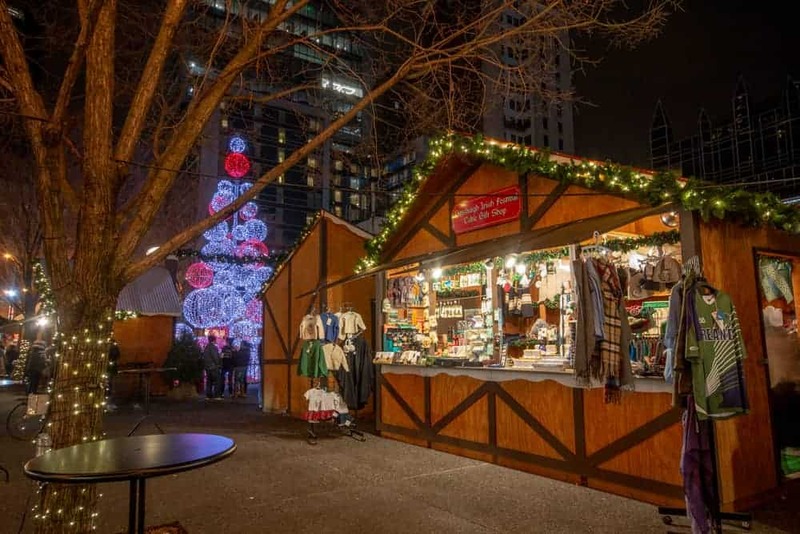 From this night through the weekend before Christmas, this market is filled with dozens of stalls that feature handmade goods, delicious foods, and other neat gifts. 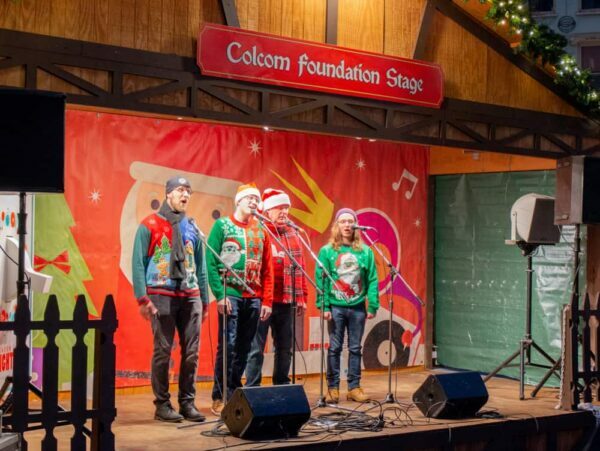 There are many stages with live entertainment on Light Up Night. Those looking for something to do with kids should check out the Fifth Avenue Freeze in Fifth Avenue Place and the children’s activities and visits with Santa in One Oxford Centre. 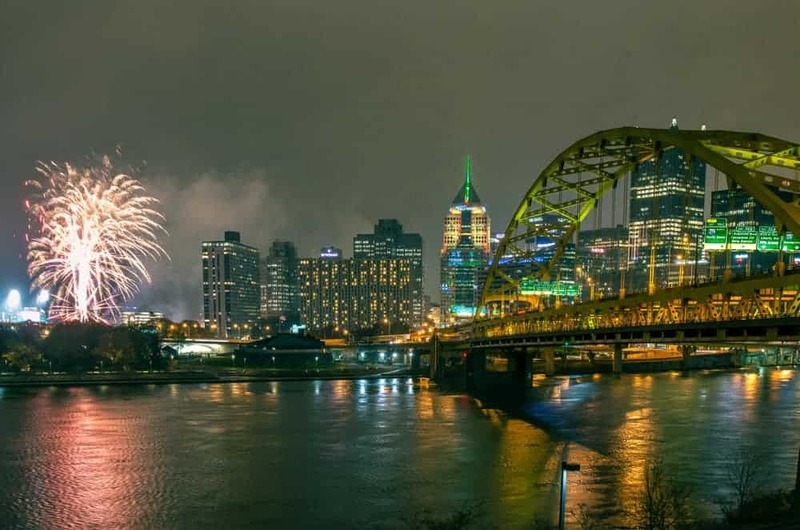 Other great activities during Pittsburgh’s Light Up Night include the opening of several Christmas-themed bars, free horse-drawn carriage rides, and three different fireworks shows. There are three great fireworks shows on Light Up Night. Yes, that’s right. I just said three fireworks shows. If you love seeing fireworks in Pittsburgh, Light Up Night is the perfect evening to head into the city. The first fireworks show during Light Up Night in Pittsburgh is shot off from the roof of the Horne Building in downtown. This is done immediately after lighting the Unity Tree on the corner of the building at 7pm. This fireworks show is quite short (2-3 minutes), but is fun to see and photograph over the building. If you want to see this show, it is best to head near the intersection of Stanwix Street and Penn Avenue to join the thousands of others who come to get a look at this tree lighting. The first of the two main fireworks shows is set off from the Point. The second fireworks show is part of the Santa Spectacular event in Point State Park and is shot off at 8:30pm. Because this is part of a separate event, it’s not nearly as well known as the official Light Up Night fireworks. These fireworks are launched from a barge that’s anchored just off the Point. 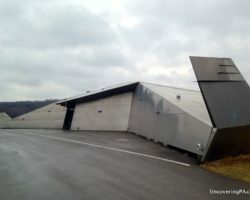 Because of this, the best vantage points will be to the west of the city (such as West End Overlook or the North Shore River Trail), though there are also good spots south of the city from Mount Washington, the Smithfield Street Bridge (where my photos are from), and from Point State Park. The 8:30 show during Light Up Night in Pittsburgh is approximately 15 minutes in length and is quite a stellar fireworks show. The Zambelli fireworks are worth sticking around for. The main event of Pittsburgh’s Light Up Night is the last fireworks show of the evening. In 2018, this show was held at 10pm, but it’s been a few minutes earlier in past years, so make sure to double check the time before heading out. This show is also launched from a barge, but this one is anchored in the Allegheny River between the Fort Duquesne Bridge and the Roberto Clemente Bridge. This is a 20-25 minute show that’s put on by Zambelli Fireworks of New Castle, PA. In all honesty, it’s one of the best fireworks shows I’ve seen with much of it feeling like a grand finale. 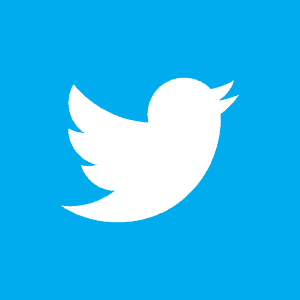 If you have access to a radio, tune it to Q92.2, which broadcasts music to go along with the show. 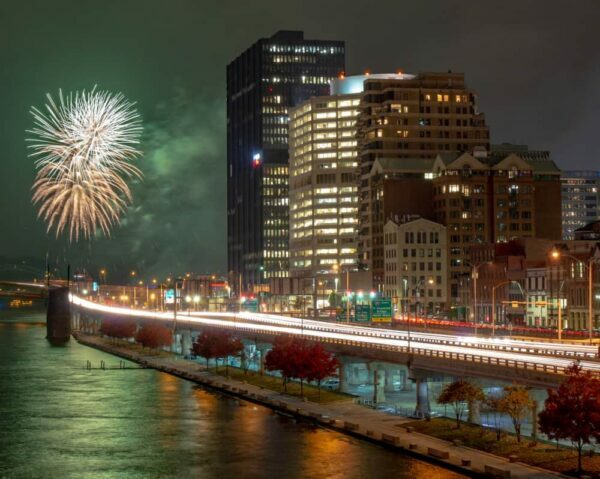 The best spots to view Light Up Night’s fireworks finale is probably from the North Shore River Trail. Other good spots include the Andy Warhol Bridge, Fort Duquesne Boulevard, and West End Overlook. Don’t miss the chance to go ice skating on Light Up Night. There is so much to do during Light Up Night that it’s basically impossible to see and do everything (Believe me, I tried). So, given that you have to make choices, here are my recommendations for what to do during the evening to make sure you see the highlights. Start off by arriving downtown in mid-afternoon. An estimated 200,000 people come to Pittsburgh’s Light Up Night each year, so getting there early will ensure you can find parking and don’t have to worry about traffic making you late. 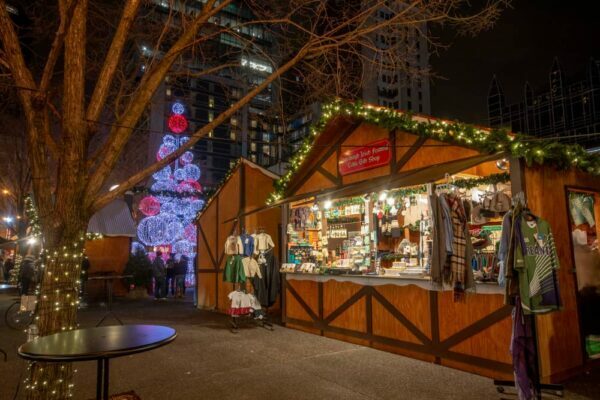 The Christmas Market in Market Square is a great spot to do some holiday shopping. 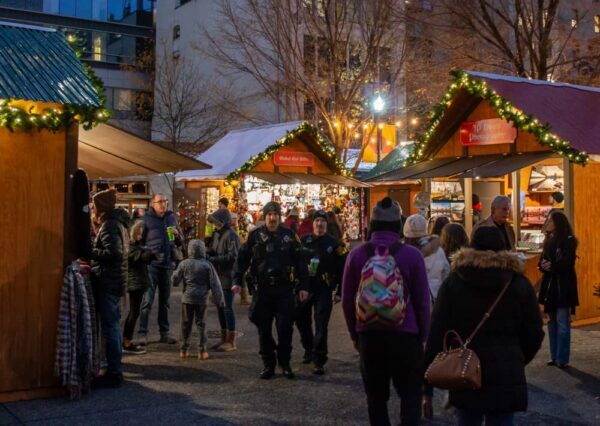 Start your time off with a little shopping in Market Square or head up east to view the lights on the City-County Building and see the Pittsburgh Creche at the U.S. Steel Building. Make your way to PPG Place for the 5:30 lighting of the Christmas tree there. 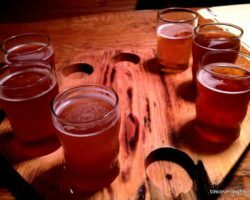 Afterwards, grab a bite to eat and enjoy some of the live music around downtown. Next, get your spot for the 7pm lighting of the Unity Tree and the fireworks near the Highmark Building. 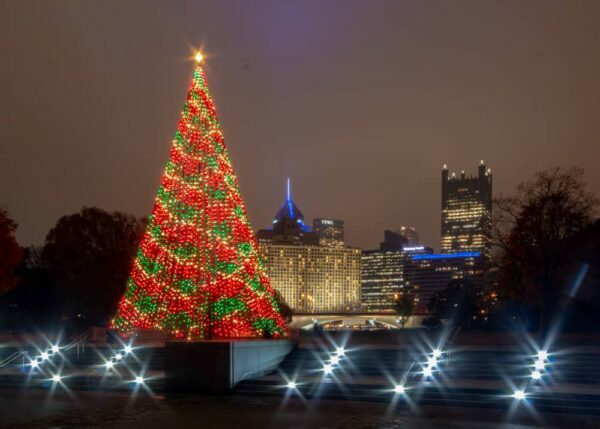 Don’t miss the beautiful tree in Point State Park. Afterwards, enjoy more of the festivities downtown (such as ice skating in PPG Place) before heading over to Point State Park for the 8:30pm fireworks show. Along the way, check out the Santa Spectacular in the park and marvel at the beautifully lit tree at the Point. After the fireworks show, go enjoy more live music, go ice skating, or do a little shopping. However, make sure to save time to walk over to the North Shore River Trail to catch the 10pm fireworks finale. 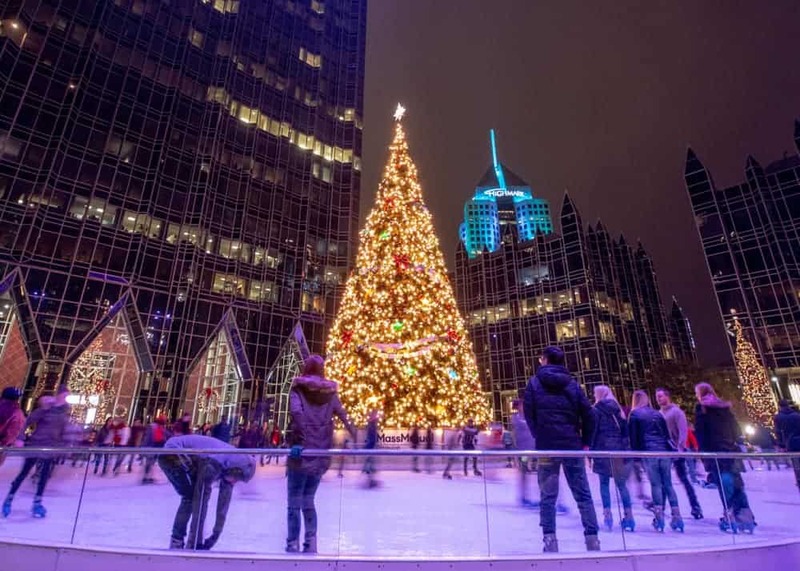 Of course, there are plenty of other great things to do during Christmas in Pittsburgh, but you’ll have to come back again before the holiday season is over to fit in the rest of the many great things to do here. With things going so late into the evening and a lot of traffic after the event, you might want to stay overnight after Light Up Night. If so, there are some great hotels downtown. I’ve personally stayed at the Wyndham Grand, which is very conveniently located near Point State Park. You can check prices for the hotel here. 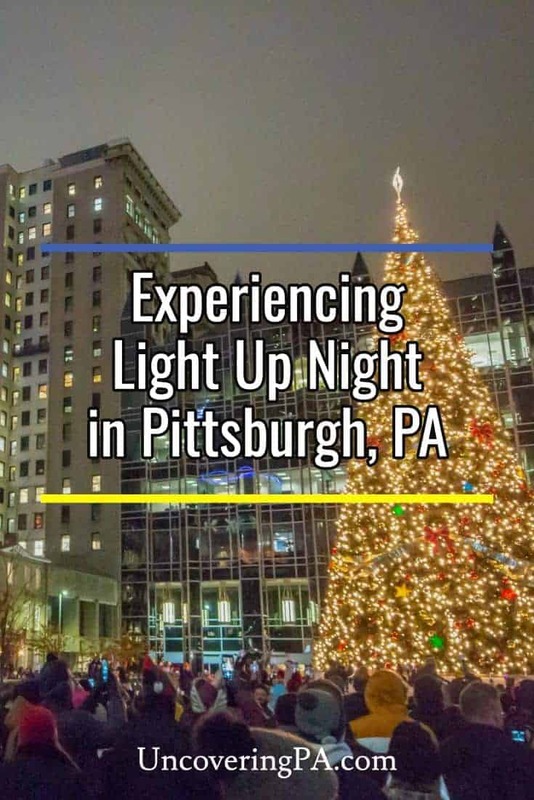 Other highly-rated hotels within walking distance of Light Up Night activities include the Renaissance Pittsburgh Hotel, Omni William Penn Hotel, and Holiday Inn Express and Suites on the North Shore.